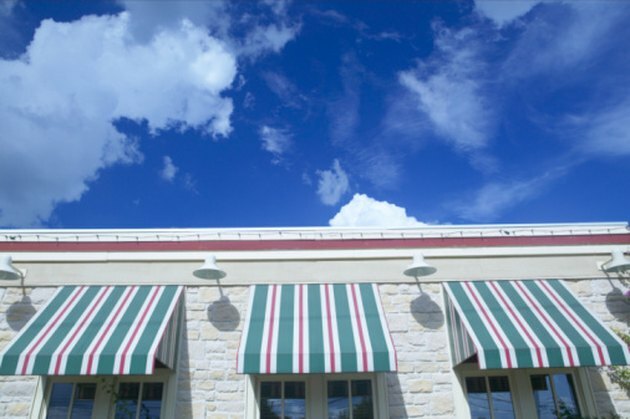 Fabric awnings consist of a fixed metal frame and a removable fabric cover. If the awning cover is worn or damaged, you can remove it and replace it with a new awning cover. You can also switch out your awning covers for newer colors and prints. Awning contractors tie on the covers using a locking style of lacing, so if one end of the tied awning becomes loose, the rest of the awning stays locked in place. Learn how to perform this style of lacing so you can replace or reinstall your awnings without having to pay an awning contractor. Awnings are laced to metal frames. Pull the awning cover into place on the frame. Line up the corner seams of the awning fabric with the corners of the awning frame and clamp in place with spring clamps. If you are putting the fabric on a curved frame, clamp both back edges of fabric as well as the center front of the fabric to the frame. Measure the perimeter of the awning with the measuring tape. This includes the sides and the front of the awning. Round the measurement to the nearest foot and multiply by three. This is the length of polyester line you need. Cut the polyester line to the correct length. Position yourself under the awning. You will be facing a line of grommets. The side of the grommets you see is the front of the grommets. You will be tying to the bar that runs beneath the grommets. The side of the bar that faces you is the front of the bar. Tie one end of the polyester line to either of the grommets that are closest to the wall. Use any knot that does not slip. Tug on the polyester line to make sure it is secure. Pass the line behind the bar that is below the grommet. Bring the line back up in front of the bar and push the line through the front of the grommet. Reach behind the grommet and pull the entire length of polyester line through the grommet, letting the length of line hang behind the bar. This forms a loop around the bar. Grab the loose end of the polyester line and feed it between the bottom of the bar and the loop, catching the line between the bar and the loop. Pull the line until it tightens. If you performed this step correctly, the line is locked and held in place between the bottom of the bar and the loop. If the line is not locked and the awning is not being held tight at the grommet, use your fingers to guide the loose line between the bottom of the bar and the loop, pulling tight to lock the polyester line in place. This completes the starter grommet attachment and is not repeated. Push the loose end of the polyester line through the front of the next grommet. Pull the line from the back of the grommet down the back of the bar, continuing it around the bottom and then to the front of the bar. Feed the line up and over the polyester line that stretches from the bottom of the bar beneath the grommet you just tied to the grommet you are now tying. Push the overlapped line so that it is directly under the grommet. Pull the polyester line until it is slightly snug. It will not tighten yet, so do not pull too hard. Pass the loose end of the polyester line back through the front of the same grommet. Pull the line from the back of the grommet down the back of the bar. Before you pull all of the excess line through the grommet, feed the end of the line around to the front of the bar and over the top of the short length of line you created in the beginning of this step. This will trap the line between the bottom of the bar and the short length of line. Hold the section of crossed lines on the bottom of the bar, directly below the grommet. With your other hand, pull the loose end of the line until the crossed lines under the bar tighten and lock. Repeat the process until all grommets are tied to the bar. Finish lacing the awning by tying a knot on the last grommet and cutting off any excess line.